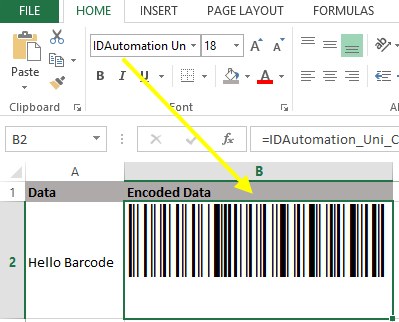 How to create barcodes using the Universal Font Package or Code 128 Universal Fonts in Excel 2013? A font encoder is a component that takes the data that will be converted to a barcode and formats it into another form of data that the barcode font can understand. The IDAutomation Universal VBA Macros is a font encoder included in the Universal Font Package or Code 128 Universal Font Package that encodes data for Excel and Access. This tutorial uses Excel 2013 as an example. IDAutomation Universal Font Package or Code 128 Universal Font Package (Sale version) is downloaded and installed. 1. Download the Universal Font Package (Demo or Sale) or the Universal Code 128 Font Package. 2. 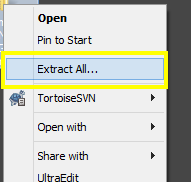 To extract the file, right-click it and select Extract All. 3. Double-click to run the EXE installation for the Font Package. 4. After the font package installs, navigate the package to the VBA folder. 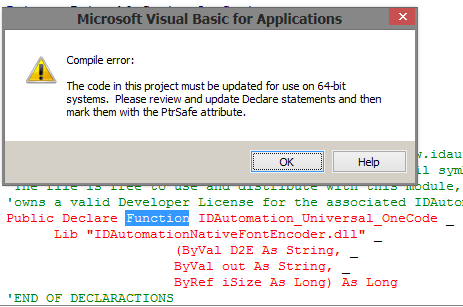 This includes the IDAutomation_UniversalFont_VBA.bas that will be imported into Excel's Visual Basic Editor. Remember the location of the file. 5. 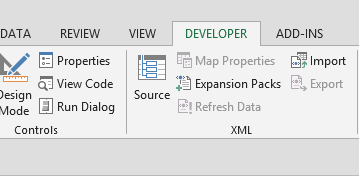 Open Excel and select the Developer Tab. 6. Select the Visual Basic icon. 7. 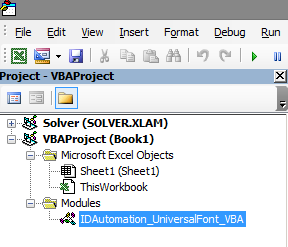 To import the IDAutomation_UniversalFont_VBA.bas, select File--Import File and navigate the VBA folder in the Universal Font Package. 8. 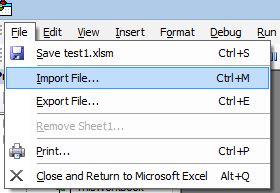 The Universal VBA is placed in the Modules folder. NOTE: Only import one instance of the IDAutomation_UniversalFont_VBA. If multiple IDAutomation_UniversalFont_VBA files (with the same file name) are in the modules folder, an "ambiguous name error" with #NAME will occur. 9. 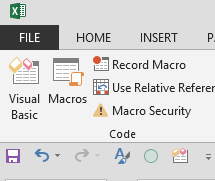 Select File--Close and Return to Microsoft Excel. Let's create a Code 128 barcode. (1) Enter data into cell A2. (3) Enter the Cell reference and parenthesis. (4) To encode the data, press return. 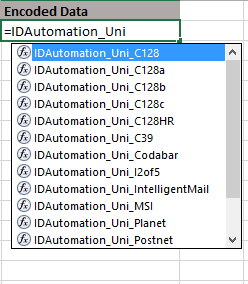 (5) Apply the "IDAutomation Uni M" to the encoded data.